I realize I am simply echoing the statements of others here, but the Magnoli Tennant coat is a work of art. Wonderfully screen accurate, and with a very elegant liner, the faux suede has a velveteen feel to it. 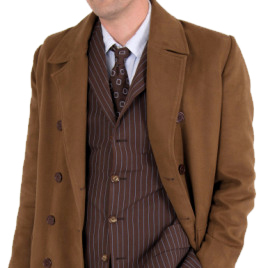 It fits over my Tennant suit like a glove, as well as having a great "slim fit" feel and look. Not only is this coat the penultimate capper to those looking to complete their own "Who" look, it would also be right at home in a formal environment with any other suit. I highly recommend the faux suede, as I truly feel that it was worth every penny. For my money, make mine Magnoli! Allons-y!